I managed to pick up some pieces printed in the 1700’s. Due to their age they are not in great condition but remain pieces which are of interest. 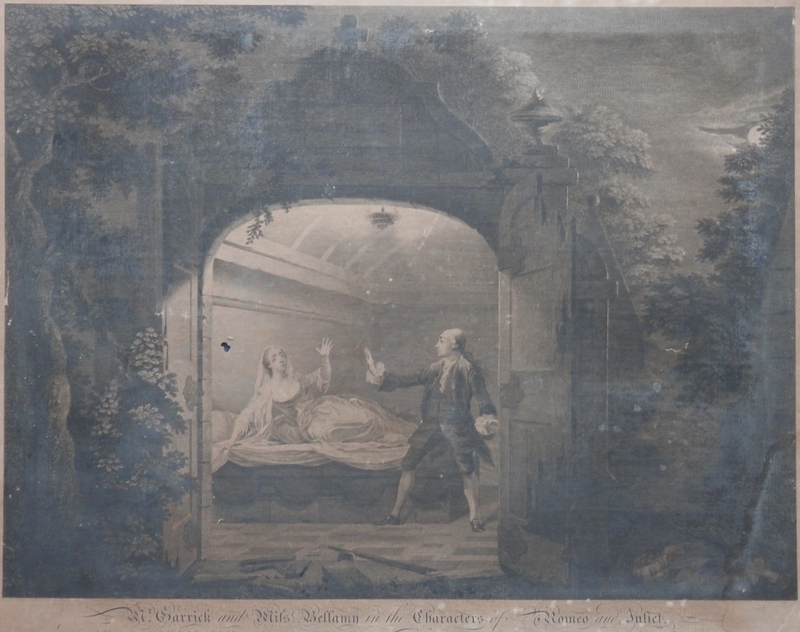 We begin with the great David Garrick and George Anne Bellamy in the characters of Romeo and Juliet (portrayed in Act IV scene III). The print is a large folio sized copper plate printed in 1753- etched by #SimonFrancoisRavenet (1706-1774) after #BenjaminWilson (1721-1788). Master Garrick was both actor and producer. He was instrumental in the revival of Shakespeare’s works during the 1700’s. He also took several liberties with the works especially Romeo and Juliet where he added dialogue – for himself mainly – and an extra scene (pictured) where both Romeo and Juliet are alive at the tomb together before their demise. You can see the original picture in the Theatre Museum in London. 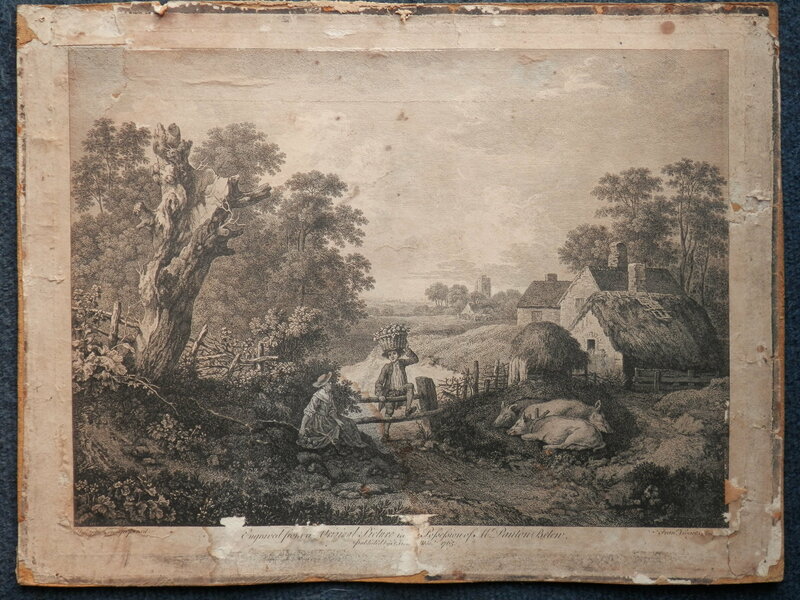 Once again in poor shape , this print by #FrancoisVivares (1709-1780) is after a painting by Thomas Gainsborough. I have called it @Young Lovers. but I have not found what its’ true title is. There is an etching called ‘The Rural Lovers’ but it is somewhat different than mine (that one has the farmer and young lady standing leaning on the tree with the animals – a dog and cattle – close-by). I have a farmer hopping a fence , a seated lass and several swine laying about. Vivares produced around 160 plates in his career – almost all published by John Boydell. Even though both prints are damaged they still are lovely to look at and hold enough of their original complete beauty to enthrall make one look closer. This entry was posted in Modern prints and tagged church tower, farmer girl, fence, lane, mausoleum, Shakespeare, swine, tomb. Bookmark the permalink.